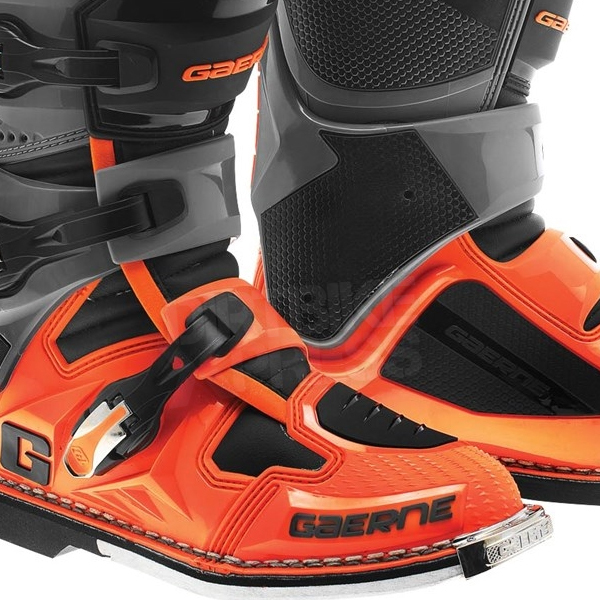 Gaerne is proud to report that Magazines world wide have put our SG12's through rigorous tests and came back with 5 Star Reviews claiming that it was the most durable, comfortable and supportive boot ever made to date. After two years in the making, we are proud to introduce the all new SG-12. At Gaerne we thrive to be the best, always looking for new ways to make a better product, always listening to our professional riders for valuable feedback, always looking to our suppliers for the very best materials. All of which translates into more value for our customers. The NEW SG-12 leads the way with many innovative features that you will only find at Gaerne. Discover the future of footwear! This new design features a new shape in the toe area for an improved feel using an upper grip panel of the shift lever and the bike's controls. The entire area is wrapped by a new plastic material which is lighter and provides more comfort and feel for the bike as well. The all new latest shape, the toecap has been re-designed and reinforced to provide a new "slimmer" look but by being much smaller and for a less-bulky feel. This revolutionary new system is patented and exclusive to Gaerne and is certainly going to be a hit. The first pivot is attached to the "Razorback". This provides a rigid component that offers a strong lateral support while a glide-plate keeps the upper in a firm and upright position. 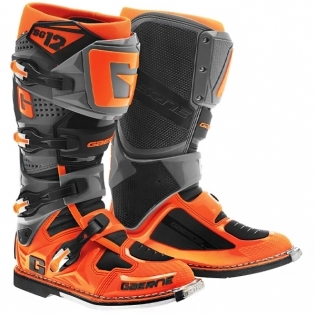 The second pivot is fixed on a sliding glide that allows the riders foot to feel natural while on the peg in a shifting or breaking situation, However, it will "bottom out" and absorb shock in the case of over-jumping a jump or in the case of unwanted compression. 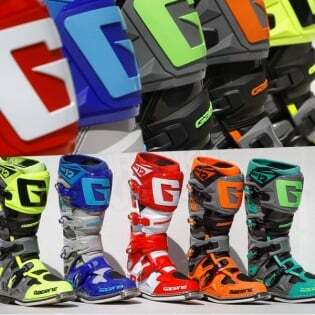 On the inner side of the boot is the all new rubber "Grip Guard". You can feel the bike with exceptional grip, as well as offering a heat resistant against your inner leg. 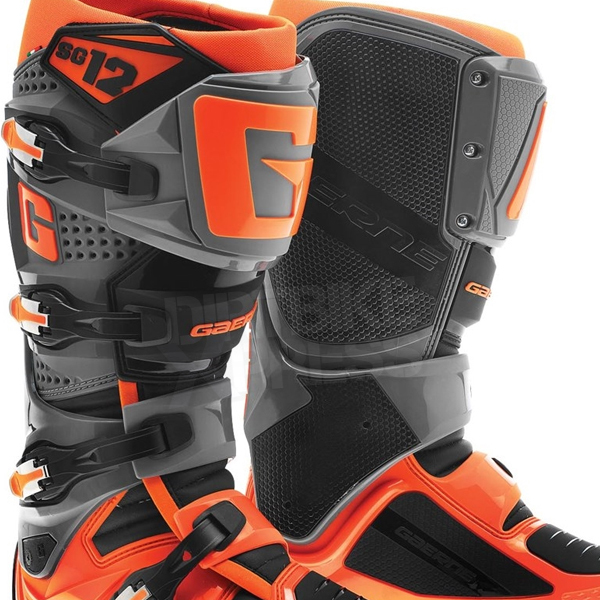 The SG12 has an additional grip guard located on the inside foot for even more control ad grip of your bike. This Thermoplastic shin plate is anatomically shaped for a perfect fit. By removing three screws a rider can also make the opening wider to accommodate a bigger leg or knee-brace. The SG-12 utilises four lightweight alloy buckles that attach to an adjustable strap. This system provides the rider "Easy in" and "Easy out" non-failure system. Made of a Swiss breathable fabric called Acronos, the gaiter is extremely stretchy but has the perfect shape to keep the sand and debris out. On the inside, you will find the famous "Gaerne Memory Cell Foam", known for the most comfortable feel and fit ride after ride. The new Heel cup has been designed to absorb shock in the case of a rear compression. Inside the boot, you will find the foot-bed which has been specially moulded to correctly support the foot which was a favourite feature for all existing SG12 riders. In the rear portion of the foot-bed, a new shock absorbing material has been used. And in the front portion, the construction has been made to allow the foot to vent.